Remember when I told you had some fun summer events to recap? Here is one of my favorites, a summer beauty Mixology event that gave attendees the chance to mix up their summer beauty routines with P&G Beauty and enjoy an exclusive mixology lesson with acclaimed mixologist Elayne Duke! 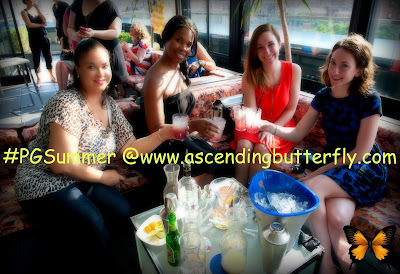 Acclaimed mixologist Elayne Duke teaches us how to mix some fun summer cocktails! There is an art to shaking which some of us learned the hard way, I think the most re-tweeted quote of the evening was 'Wasted Booze is a Crime' which made us all laugh! Like most things in life, it's all in the ratio/balance! I will admit the cocktails were super refreshing for summer and I can't wait to try these out on my friends this summer! That's me on the very left! We are holding up 'Double Trouble' one of the summer cocktails that Elayne Duke taught us how to prepare! Wanna see a hot mama drinking a hot mama? 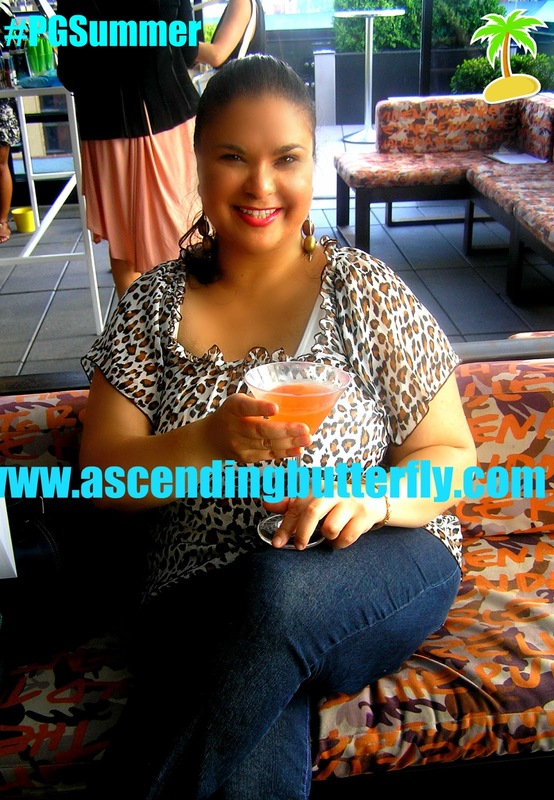 Tracy of Ascending Butterfly enjoying the Hot Mama Cocktail that she learned how to make! Then it was time to explore the Beauty Stations! I got a braided updo, had my makeup touched up and enjoyed a manicure in the color I have been enjoying all summer Orange! CoverGirl Outlast Stay Brilliant Nail Gloss, Vidal Sassoon Pro Series, the NEW Gillette Venus & Olay Razor, Secret Clinical Strength Waterproof Antiperspirant/Deodorant, VS PrecisionMix Color Creme Formula Hair Color, CoverGirl Outlast Stay Fabulous 3-in-1 Foundation, Olay Ultra Moisture Body Wash, Olay Regenerist Micro-Sculpting Eye & Lash Duo, Natural Instincts Hair Color, Head & Shoulders Damage Rescue, Complete All Day Moisturizer with Sunscreen Broad Spectrum SPF 15, Vidal Sassoon Pro Series Color Collection The Color Protect Shampoo & Conditioner as well as The Color Protect Spray, CoverGirl New Clump Crusher by LashBlast Mascara, CoverGirl BlastFlipStick, New Pantene Age Defy Collection. This was a fun way for P&G Beauty to share great products with us in a venue with a great view and a fun, relaxed summer vibe. I enjoyed getting my hair done, makeup re-touched and my great Orange Manicure too! But the Mixology lessons just might be my favorite, we were all surprised at just how refreshing the Double Trouble was as few of us had actually tried Ginger Beer and we all expected it to be over-powering but it wasn't. The Hot Mama was delish also! Ƹ̵̡Ӝ̵̨̄Ʒ - For the face on average you need the size of an almond. 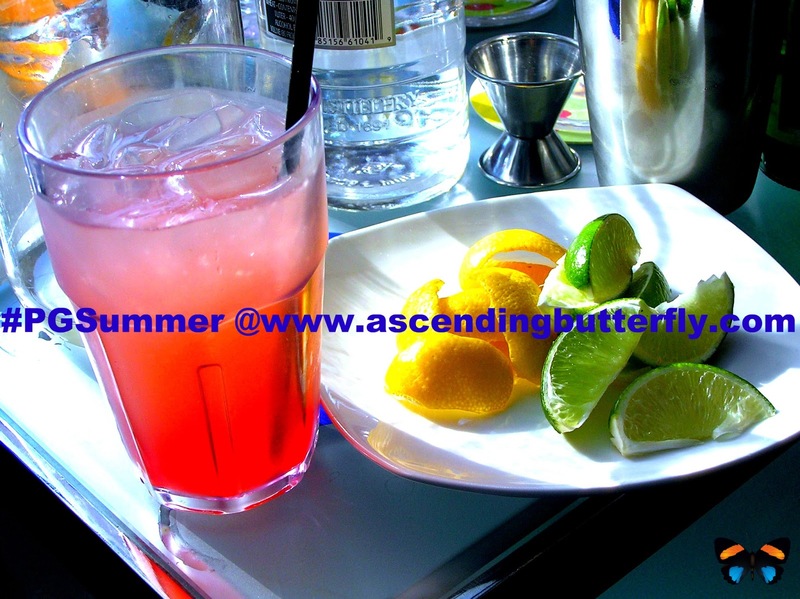 Ƹ̵̡Ӝ̵̨̄Ʒ - Summer sun is especially dangerous UV intensity tends to be highest during the summer months. Ƹ̵̡Ӝ̵̨̄Ʒ - Long Car rides a big part of your summer? Glass does NOT block UVA. Glass filters UVB, but if light shines through, so does UVA. Ƹ̵̡Ӝ̵̨̄Ʒ - Eyes age 36% faster than the rest of a woman's body so it's super important to protect them from summer rays! 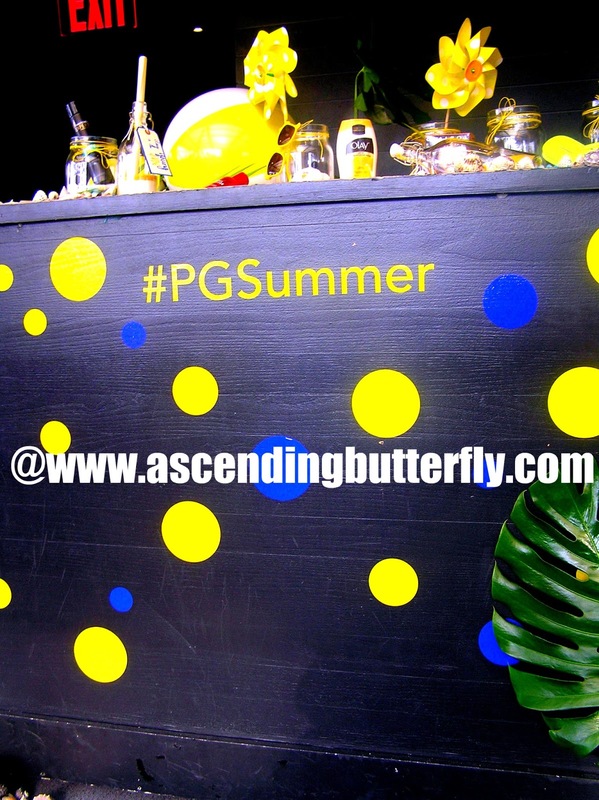 And of course you can see these photos on our #PGSummer Pinterest Board too! Butterflies, what P&G Beauty Products are part of your summer beauty routine? FTC Disclosure: This is NOT a compensated post. This is an event recap, and no compensation has been received to share our recap coverage, all opinions are 100% my own. From a butterfly too a Hot Mama not bad !! !I love your recaps of products that you've tried I have found some great products this way so thank you ! @Big Happy Buddha - I am glad our reviews have helped you to find great products!